The Community Learning Programs at Herron School of Art and Design have launched a new program this summer for students considering studying art and design at the university level. The Herron Pre-College program immerses incoming high school juniors and seniors as well as college-bound graduates in a studio art environment while offering a glimpse of the IUPUI undergraduate experience in downtown Indianapolis. The new program will run alongside Herron's annual Teen Intensives and Youth Art Camps held in June 2018. Modeled after the school's first-year foundations studies coursework, Herron's Pre-College curriculum will offer an intensive opportunity to build upon and advance students' portfolios in preparation for studying art and design at the collegiate level. Over the course of two weeks, high school juniors, seniors, and recent graduates will develop critical thinking skills and explore creative freedom through a full-day of classes and workshops at Eskenazi Hall and Eskenazi Fine Arts Center on the IUPUI campus. All Herron Pre-College students will work closely with Herron faculty and have access to dedicated studio space to complete their assignments. Outside the classroom, students will experience guided visits to campus eateries, bookstores, the University Library system, and excursions in downtown Indianapolis such as the Canal Walk and White River State Park. At the conclusion of the program, students' achievements will be celebrated with a closing exhibition and reception. Herron Pre-College runs June 11 to June 22 from 8:30 a.m. to 4:30 p.m. Tuition is $850 plus a $25 application fee and includes all materials. For more information about Herron Pre-College including how to apply and frequently asked questions, visit herron.iupui.edu/pre-college. Summer offerings from Herron's Community Learning Programs will also include Teen Studios and Youth Art Camps. Teen Intensives are offered Monday through Friday as either half-day or full-day sessions. Youth Art Camps run Monday through Friday from 8:30 a.m. to 4:30 p.m. IUPUI employees, siblings, and repeat enrollees receive a $20 tuition discount, and qualifying families may receive financial assistance. Session times and tuition fees vary. Tuition prices include all materials. Registration is now open at HerronCommunity.org and space is limited. For inquiries about the Community Learning Programs at Herron, contact Colton Pedro at clpedro@iupui.edu or 317-278-9404. 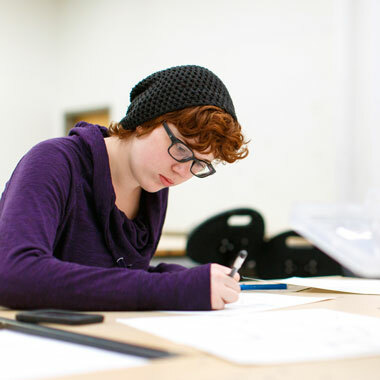 Drawing (Grades 7-9): Learn advanced drawing techniques using graphite, charcoal, and ink while working in Herron's spacious drawing studios. Drawing runs June 11 to June 15 from 8:30 a.m. to noon. Tuition is $160. Participants wishing to take their drawings further may also enroll in the afternoon Image-Making intensive. Image-Making (Grades 7-9): Explore image-making techniques and visual representation through painting, printmaking, and collage to turn drawings into imaginative works of art. Image-Making runs June 11 to June 15 from 1 p.m. to 4:30 p.m. Tuition is $160. Participants may also enroll in the morning Drawing intensive. Design it, Print it, Wear it (Grades 7-9): Learn the fundamentals of 3D-modeling and discover how today's artists and designers are using new technologies to digitally design cutting-edge jewelry. Design it. Print it. Wear it. runs June 18 to June 22 from 8:30 a.m. to noon. Tuition is $190. Pre-College Prep (Grades 9-10): Explore a variety of studio art disciplines while learning from Herron faculty and gaining a deeper understanding of contemporary art. This intensive is designed for high school freshmen and sophomores and can be used in preparation for applying to the 2019 Herron Pre-College program. Pre-College Prep runs June 25 to June 29 from 8:30 a.m. to 4:30 p.m. Tuition is $300. Art: World Expedition (Grades 3-4 and 5-6): Explore the vast diversity of world cultures through art from every continent and work on projects inspired by artists from around the globe using a variety of media – from drawing to painting, clay to fibers. Art: World Expedition runs June 11 to June 15 from 8:30 a.m. to 4:30 p.m. Tuition is $300. Art: In Color (Grades 3-4): Experiment with the vibrancy and excitement of color through a variety of studio projects – from large paintings to tiny sculptures. Art: In Color runs June 11 to June 15 from 8:30 a.m. to 4:30 p.m. Tuition is $300. Art: Across the Universe (Grades 3-4 and 5-6): Take on the roles of space explorer and galactic artist to imagine what art would look like in space, then explore the possibilities through drawing, painting, and sculpting. Art: Across the Universe runs June 18 to June 22 from 8:30 a.m. to 4:30 p.m. Tuition is $300. Art: Across Time (Grades 5-6): Travel across time and create projects inspired by art history, from the earliest human artifacts to the Renaissance painters of Europe and into the present day. Art: Across Time runs June 18 to June 22 from 8:30 a.m. to 4:30 p.m. Tuition is $300. Art: Illustrate and Animate (Grades 3-4 and 5-6): Create characters experimenting with traditional and digital drawing techniques then bring them to life as clay models, flip books, and digital and stop-motion animations. Art: Illustrate and Animate runs June 25 to June 29 from 8:30 a.m. to 4:30 p.m. Tuition is $300.